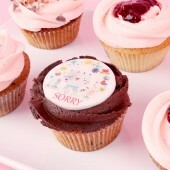 One might live a happy life but once in a while everyone may fall in need to say 'sorry'. And that needs to be done with style and taste. In other words: with a cupcake. 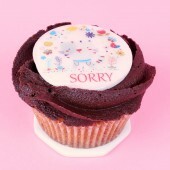 Not just any cupcake, but a very delicious, beautiful, and loved one. An irresistible one. 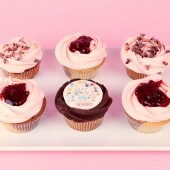 Like the one and only Raspberry and Chocolate cupcake - with cocoa frosting and a kitten on top. 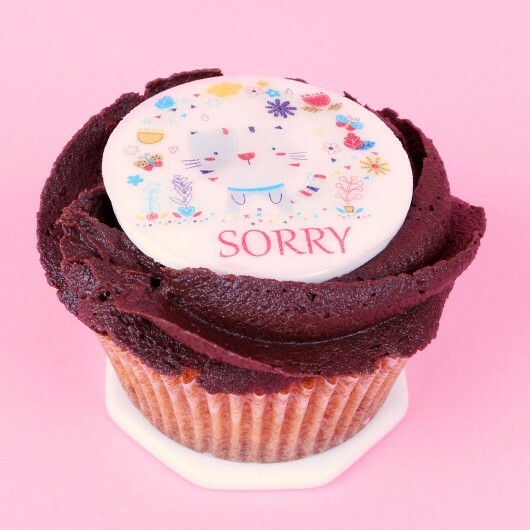 Who would dare be upset in front of a cupcake like that at all? Ingredients: Cow's butter, powdered sugar, white sugar, cream cheese, eggs, white flour, raspberry jam, natural chocolate chips, marble chocolate curls, baking powder, salt. Decoration: fondant, glaze, rice paper, edible food paint.